On a visit to France with my wife, Corinne, to spend Christmas with her parents, we took the opportunity to explore the area. One day we travelled to the beach known as Plage de la Chambre D'Amour, where we enjoyed good light and spectacular breakers. 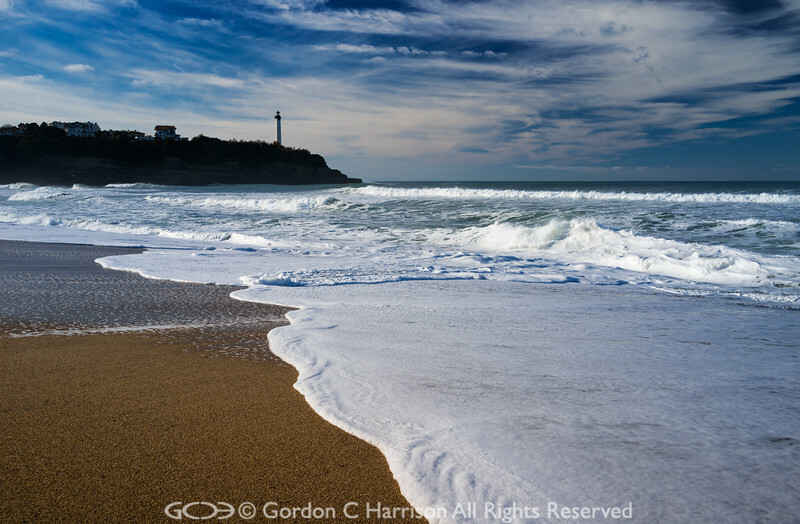 What attracted me to photograph this scene was the light, the peninsula with the lighthouse known as Phare de Biarritz, and the breakers. Unknown to me at the time this was the beach Corinne and her sister frequented as often as possible to enjoy swimming, sunbathing and collecting the shells known locally as Yeux de Ste Lucie - they are not easy to find! So, given this knowledge I have decided to rename this beach 'Corinne's Beach', with apologies to her sister!